������ Chumphon is a sea coast city parallel to the Gulf of Thailand. It is the gateway to other southern provinces. Along more than 200 kilometres of Chumphons seashore, there are many beautiful and picturesque beaches. Still maintaining the natural beauty, the province is best for those who seek relaxation in the natural and uniquely quiet atmosphere. From Bangkok, use highway no.4, or highway no.35 (Thon Buri - Pak Tho) and join highway no.4, pass Petchaburi, Prachuap Khiri Khan, to Chumphon junction, then turn left along highway 4001 for 8 kilometres to town. There are regular buses of Transport Co., Ltd. from the Southern Bus Terminal to Chumphon everyday. For more details, contact the Southern Bus Terminal at Tel: 0 2434 5557 - 8, 0 2435 1199 or visit www.transport.co.th For the round-trip, buses leave from Chumphon Bus Terminal at Tel: 0 7750 2725, 0 7751 1094. Chok-anan Tour: in Bangkok at Tel: 0 2435 5027 - 9, 0 2435 7429 or in Chumphon at Tel: 0 7751 1480, 0 7751 1757. From Thon Buri Railway Station (Bangkok Noi): There are fast trains to Chumphon everyday. For more details, contact at Tel: 0 2411 3102. Air Andaman flies from Bangkok to Chumphon. Call 02229 9555 or visit www.airandaman.com for more information. Bus Chumphon - Sawi - Lang Suan Route: The terminal is in front of Chumphon Market, Thanon Tha Taphao from 6 a.m.-6 p.m. Taxi queue is behind old market, opposite to Chumphon Bus Terminal. Taxi can be hired to Lang Suan, Ranong and Surat Thani. Being the origin of rivers and canals in Chumphon, this Park covers the area in Amphoe Thung Tako, and Amphoe Mueang. Use highway no.41 to Lang Suan Crossroad, turn right for 15 kilometres. In rainy season, the best vehicle to use is 4-wheel drive. There are many natural attractions such as Namtok Thap Chang, a 2-level, middle sized waterfall which is the most beautiful in the Park. The Parks area is suitable for overnight, bird watching, and trekking for nature study. For further details, please contact the Natural Resource Conservation Bureau, Forestry Department, at Tel: 0 2579 7223. Situated on Hwy 41, 54 km from the town of Amphoe Thung Tako, the orchard produces good quality fruits such as tangerine, papaya, dragon fruit, and Mayong Chit (marrian plum). The orchard is a perfect highway stop, ideal for taking a break from a long drive. A restaurant, coffee shop and souvenir shop are located in a beautiful lush green area. Remarkably, the orchard offers a unique toilet. The toilet at Nai Dum’s Fruit Orchard won the award from the Nation’s annual toilet competition in 2006. In addition, it had been proclaimed by the Ministry of Public Health to be a Thai public toilet learning centre, which is regularly visited by students and organizations. Mr Dum, the orchard owner, had the intention to develop this public toilet to be a pleasant place for visitors. Therefore, his idyllic and hygienic toilet is surrounded by nature; with flowers, trees and miniature waterfalls. This is a large long beach parallel to the line of coconut palms. It is the most beautiful beach in this district suitable for relaxation. This beach is in Mu 3, Tambon Lamae. Tourists can get there by car, from Phetkasem Road via Lamae District intersection, then turn left into a brick road and go on for about 7 kilometers. This place is one of the most popular tourists spots in Lamae District. It is in Mu 2, Tambon Suan Taeng, 7 kilometers away from the district center along Highway 41. There are 3 hot spas here at the foot of the mountain slope. In the vicinity, there are also 4 caves with beautiful stalactites and stalagmites. Wildlife such as squirrels, pig-tailed monkeys and birds of different species are scattered arround the area. Available of the private cabin to relaxing in the hot spring bathtub and pool area in the shade of trees. For more information, please contact to Tambon Suan Taeng Administration office Tel : 0 7752 0136. This island is in Tambon Bang Nam Chuet and is one kilometer from the shore. The island has beautiful rocks and many fishing villages. When the tide is low you can walk from the shore to the island. A beautiful and well-known beach of Pathio, it is most popular among Thai and foreign tourists. Being situated in Tambon Saphli, it is 16 kilometres from Chumphon along Chumphon Hat Thung Wua Laen route. 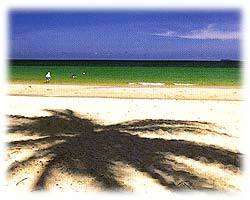 The beach has white, fine sand, with small slope, which is suitable for swimming. Also it is one of the most famous snorkeling spots in Chumphon, with the view of seaweed, sponge, and sea flowers. Even though it is a small island far off in the sea but it is well-known in its beauty of beaches and coral reefs. Although this island is in Surat Thani, visitors can travel by speed boat or regular boat from Chumphon. Tha Yang Pier - Tourists can hire pick-up car from Chumphon to Tha Yang Pier which is about 7 kilometres away. The boat leaves from Ban Mae Hat to Ko Tao every night at midnight and arrive at Ko Tao at 6 a.m. of the next day. On the return trip, the boat leaves from Ko Tao at 10 a.m. and arrive at Tha Yang at 3 p.m. The round-trip fare is 200 baht. For more details, contact Tel: 0 7755 3052 - 4. Songserm Rungrueang Co. , Ltd. - The boat leaves from the pier at 7 a.m. and arrive at Ko Tao at 10 a.m. On the return trip, the boat leaves from Ko Tao at 3 p.m. and arrive at Chumphon at 5.30 p.m. The round-trip fare is 400 baht. For more details, contact Tel: 0 7750 3735. Ekkawin Tour - The boat leaves from Tha Yang pier at 7.30 a.m. and arrive at Ko Tao at 9.30 a.m. On the return trip, the boat leaves from Ko Tao at 10.30 a.m. and arrive at Chumphon at 12.30 p.m. The round-trip fare is 400 baht. For more details, contact Tel: 0 7750 1821, 0 7758 0273 - 4. There is also a boat service leaving from Ekkawin Pier or Lom Lak Pier at 7 a.m. and arrive at Ko Tao at 9.30 a.m. On the return trip, the boat leaves from Ko Tao at 10 a.m. and arrive at Ekkawin Pier at 3 p.m. The round-trip fare is 400 baht. This is a small island with 50-metre long, beautiful beach, including the coral reef in the west. Visitors who wish to visit this island should obtain permission from the Provincial Office 15 days in advance because of the monopoly of the business in the sparrow's nests of the island. Situated at the border of Amphoe Mueang and Tha Sae, this park is 12 kilometres from Chumphon along highway no.4 (Chumphon - Tha Sae route). In the park, there are many kinds of plants. At the front, are the parks gate and Prince Chumphons Shrine. The top of the mountain is both the cut-edge cliff suitable for hangliders and the view-point for Chumphon town. This mountain is next to Hat Sai Ri along the coast for 2.5 kilometres. On top of this mountain, there is a pavilion for view watching. And further from this area around one kilometre, there is an open area where a panoramic view of the various islands in the sea can be viewed. Located in Chumphon Governmental Center on Phetkasem Road at km.484 before approaching Pathomphon Junction, the museum displays historical and important ancient materials of Chumphon. The displays are divided into the following parts: History of Chumphon; Chumphon during World War II; Chumphon and the Typhoon; Nature and Outstanding Heritage of Chumphon by means of pictures and movies. The museum is open for the public from Wednesday to Sunday, except official holidays, during 9 a.m.-4 p.m. The fee is 30 Baht per person. For more details, contact at Tel: 0 77504105, 504246. With some areas as part of the National Park, this island has white beach and clear water. It takes only half an hour to get to this island. From town, use Phetkasem Road, turn right at the 426th kilometre for 21 kilometres The beautiful beach in Tambon Pak Khlong is more than 5 kilometres long. The highlights of the area consist of different-shaped limestones and seaside villages, parallel to the road and pine tree line, suitable for easy driving or biking. The beach is extended to Bang Boet in Prachuap Khiri Khan, which is presently the area of H.M.the King's project. This temple is the archeological site in old Chumphon, at Tambon Tak Daet. It is on the left-hand side of highway no.41 (Chumphon - Surat Thani), after passing Tambon Wang Phai and across Saeng Daet Canal. Some archeological objects were found such as sand-stone Buddha image in Srivijaya Period, Chedi containing Lord Buddhas bones. The decoration of the gate, walls and other buildings have portrayed the local architectural designs at this temple. Located on Chumphon Ao Thung Wua Laen route, tourists can reach this temple by turning left for 6 kilometres, before reaching Chumphon Irrigation Office. This old Wat is worshipped among the Chumphon people through the strong faith in Luang Pu Song. (A most revered monk whose body has been believed to be in an undelaying condition after his death. A big Sala tree is inside the Wat with orange flowers and strange looking shape stem. (Lord Buddha was born under Sala tree). Having been announced in 1989, this National Park covers the total area of beaches and islands of 198,125 rai (1 acre = 2.5 rai). The Parks Office is 21 kilometres from town. Using highway no.4001, turn right to Hat Sai Ri, then turn right again for 8 kilometres. The Tourist Information Center is connected with the wooden-bridge walkways for nature study of plant and animals. Visitors can travel by boat or can stay overnight in their tents near the office. The beautiful beaches in the park include Hat Thung Makham and Hat Sai Ri in Amphoe Mueang, Hat Arunothai in Amphoe Thung Tako, Hat Tong Khrok in Amphoe Lang Suan. In the sea are more than 40 islands such as Ko Chorakhe, Ko Ngam, Ko Samet, Ko Maphrao, Ko Mattra, Ko Thong Lang, Ko Langka Chio and few islands in Amphoe Thung Tako. On some islands, there are diving sites, fine white sand beaches and corals; such as Chorakhe Island in the northern part of the park. Ngam and Lanka Chio Islands have many sea sparrow's nests. Around Ngam Island, there are perfect coral reefs which are the interesting sites for diving. Thong Lang Island has white and beautiful beach. Tourists can hire boats to travel along these islands at the appropriate price. Contact at Tel: 0 7755 8144.